It can be said that Agilent Lab's George Yefchak has a reputation for knowing how to play. And yet, no one can accuse him of not knowing how to conduct himself. In fact, George has frequently been the center of attention when conducting others. George, a Member of Technical Staff in the Analytical/Medical Laboratory's Chemical and Biological Systems Department, has many talents and interests, and one of his more notable talents is in the field of music. George began playing piano at age six. He took up the clarinet in the fourth grade, and moved on to the oboe in high school, continuing to play in various high school and college ensembles. After a few months in grad school, he had to stop playing oboe due to time demands. His hiatus lasted seven years. Soon after joining HP, George heard about the Hewlett-Packard Symphony Orchestra and became a member, at first playing the synthesizer. It wasn't long, however, before he returned to the oboe. Soon thereafter, the orchestra's conductor left HP, and George filled in for a rehearsal. He has been the principal conductor ever since. 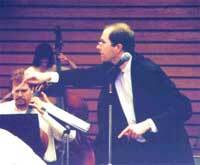 Dan Dickerman, with HP, shares the duties as assistant conductor. George says, "Conducting is really a great opportunity for me. I actually get to have that experience every week, yet there are many people working on degrees in conducting who do not have an orchestra to conduct!" When George started conducting the HP Symphony, his only training in conducting was from a high-school music theory course. He has taken to it quite well, and has now studied privately with two conductors in the Bay Area. In addition to actually conducting the musicians, many of his duties involve organizing rehearsals and recruiting musicians. George also designs the orchestra’s advertising materials and typesets the concert programs. George enjoys all aspects of conducting and notes that conducting requires very different skills than those used when performing on an instrument. "You don't have to worry about whether you can play the notes or if your instrument is in tune. But on the other hand, there are a thousand other problems you do need to worry about." Explaining further, he says, "There is a grammar to conducting. Certain hand gestures mean certain things, and any orchestral or band musician knows what they are. The movements require practice, but once you get to the level where you know what your hands should do, then the rest of the responsibilities become a matter of prioritizing -- getting the brass section to come in together at the precise moment or making eye contact with the cello player for a solo, and so forth, while ignoring something else that’s likely to work well without your help." The HP Symphony is not the only organization in which George displays his musical talents. A fellow HP Orchestra musician asked George to fill in with Palo Alto Chamber Orchestra (PACO) one night. That was about six years ago, and George is still playing with them. George has been playing oboe with the Redwood Symphony for about six years as well. This orchestra plays mainly at Cañada College in Redwood City and frequently attracts an age-diverse audience of about 300-400 music lovers. One of George's favorite musical experiences was when the Redwood Symphony performed at Davies Symphony Hall, accompanying the San Francisco Gay Men's Chorus. George considers himself quite fortunate to have been given the opportunity to play at such an exceptional venue. The time commitment for three orchestras can be significant. The HP Symphony has two concert seasons per year. There are two months of weekly rehearsals per season. Half of the rehearsals are held during the lunch hour, and the other half are two-hour sessions held in the evening. PACO has three rehearsals per concert. As part of the hired winds, George typically performs in four to five "senior" concerts per year, plus a few more with some of the younger groups. The Redwood Symphony kicks off their 2000-2001 season on October 15 with a Mozart, Tchaikovsky, and Mahler program. Tickets are extremely reasonable at $12 for adults, and $6 for children, and can be ordered by calling 650-366-6872 or online through their website. You can see Maestro Yefchak and Agilent Labs' Russell Iimura, who plays timpani, at the HP Symphony's "Friends & Family" concert on Friday, November 10, in the Oak Room, Building 48 at the HP Cupertino site. The theme of the program is "Music Across America" and will feature the world premier of "Duplex," a score written by orchestra manager Herb Gellis. The concert is open to the public at no charge and begins at 6:30 p.m. More details on the concert are available on their website. It's not every technology company that can boast an orchestral conductor amongst its ranks. Labs is fortunate to have a diverse workforce who possess amazing talents and skills. You can learn more about George's interests outside of work by visiting his website. We at Labs don't often have the opportunity to get to know our neighbors. If you volunteer, have a unique hobby or outside interest, or have had an unusual experience or vacation, send me a note. I'd like to share your story. With your help, we can get to know each other a little better and strengthen the sense of community that helps make Agilent Labs a great place to work.